maharashtra seems to be heading towards a drought-year. On July 9, the state government declared a 'drought-like' situation in 16 districts of the state. The Maharashtra cabinet took this decision in view of the below-average rainfall in many regions of the state that has led to crop loss, delayed sowing, acute drinking water and power shortage. According to official data released on July 9, 16 of the 35 districts in the state have received less than 50 per cent of the normal rainfall. Nashik, Solapur and Marathwada are the worst affected regions they have received less than 10 per cent of their average rainfall. Only five districts--Mumbai, Mumbai suburban, Thane, Raigad and Satar--have received above average rainfall. The situation elsewhere in the state is grim only 31 per cent sowing is complete and the dams are barely 22 per cent full.Vilasrao Deshmukh, the state's chief minister, has communicated to the Union ministry of agriculture that this year could be worse than 1972 when the state was hit by one of the worst droughts in its history. The situation has prompted the state to launch an unique employment guarantee scheme (egs) which involves providing work--actually unskilled labour like digging trenches, bunding, planting trees--on demand to any villager. The government has issued orders to all district collectors to launch works under egs and also supply water in affected villages through water tankers. It has also announced a slew of measures to tackle the impending drought, but the situation is only worsening by the day. It has also issued orders directing the revenue department to stop collecting revenue from affected farmers and not cut their electricity supply. Marathwada region is one of the worst affected regions in Maharashtra where farmers have already declared a drought year. They claim that even if the rains came now, it would be of little use as sowing has been delayed and a season lost. At best, a bajra crop can be taken, they say. The yield of kharif pulses such as udad, moong and toor is expected to be badly affected, further increasing pulse prices. With elections round the corner, the state's chief minister and deputy chief minister are touring the drought-affected areas to assuage the drought-struck, some of whom have been driven to seek divine intervention. Women from Nanegaon and Pasegaon in Paithan tehsil of Aurangabad district have brought water from the river Godavari to perform 'abhishek' of God Shankara, a ritual they believe will 'please' the rain god. On July 9, the day drought-like situation was declared, a special mass namaaz was offered at the Idgah at Omerga taluka in Osmanabad. According to the Aurangabad revenue commissioner's office, 67 of the 76 tehsils in Marathwada region have received less than 50 per cent rainfall. Only 19 per cent of the arable land is under crops in the region, considered a backward area of the state. The situation is tense in Beed, Latur and Osmanabad districts. Sowing was complete on about 1-2 per cent of the arable land. Dams in Marathwada such as Yeldari, Siddheshwar, Majalgaon and Manjra are totally dry. Jayakwadi, Nimna Terna and Manar are only 23 per cent, 12 per cent and 9 per cent full respectively. Groundwater levels are dipping fast and there is an enormous scarcity of drinking water. In Marathwada alone 1,108 water tankers have been pressed into service to supply drinking water to 1,414 villages. The Down To Earth correspondent came across disturbing stories in the affected villages. 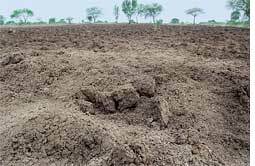 Dagdu Waghmode, farmer of a small village Adgaon Budruk in Aurangabad district, says, "We have purchased seeds and pesticides; and 25 per cent farmers have even completed the sowing. And now everyone is waiting for the rains. But it seems to be playing truant. All seeds and pesticides will go waste now. We cannot use these pesticides next year because by then they will be stone hard." Most farmers have taken loans for purchasing seeds and pesticides, and do not know how to repay. "Two months back I purchased a pair of bulls for Rs 50,000. Now when I try to sell them, no one is ready to give me even Rs 20,000. If these cattle die, it will take me at least 10 years to buy a pair," Waghmode rues. 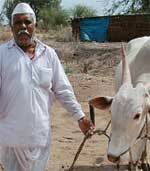 Wishwanbhar Hake, another farmer adds, "Ours is a milk-producing village and we have more than 2,000 cows. We supply more than 4,000 litres of milk everyday. But now it is becoming extremely difficult to maintain these cows. There is no fodder for cattle". Fodder prices have already sky-rocketed. "A bundle of jawar fodder used to cost Rs 5-6. But now it costs Rs 20 a bundle. We are using sugarcane as fodder, but even its price has skyrocketed. We are buying sugarcane for Rs 2,500 per tonne while it's sold to sugar mills at Rs 550 a tonne. Four butchers visit our village almost everyday and buy 15-20 cattle. Villagers have no option but to sell their cattle and gold ornaments," Hake rues. In Adgaon Budruk, Shiwajirao Lokhande's 200 full grown orange trees are dying for lack of water. "I have no option but to cut them down. So far I have axed down more than 100 trees. I have no money for either seeds or pesticides. This year I took a loan of Rs 14,000 at an interest rate of 5 per cent. I had plans to sow cotton, but all that has now gone waste as there is no rain," laments Lokhande. Farmers are an angry lot and have little faith in the government. "The government should close down its weather department, which fools us every year. This year too the department had 'predicted' good rainfall. So the farmers purchased seeds and pesticides at double the usual rates before June. But there is no rain. Seed and pesticide companies are still trying to fool us by saying we can sow in July. By this time of the year, our cotton crop used to be a feet tall. This year we have already lost legumes, pulses, mango, groundnut and soya bean. 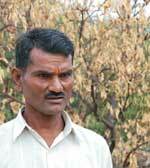 Cereals are our last hope," says Rajendra Dawle of Adgaon Budruk. The much vaunted egs hasn't been of much help. "The state government has announced various measures to tackle drought but all these have remained only on paper. Nothing has happened on the ground. Over 90 per cent people now urgently need egs work. Fodder to Marathwada comes from western Maharashtra, but with fodder becoming scarce we fear the state government will ban inter-district transport of fodder. Cattle camps should be started immediately," says Ramrao Lokhande of Adgaon Budruk. The situation in other villages of Aurangabad district such as Chincholi, Pardari, Ekoda, Pachod, Nipani, Takli, Zalta, and Gandheli is the same. In neighbouring Jalna district, the 722 orange-producing villages are reeling under the dry spell all wells have dried out. More than 11 lakh orange trees have burned down due to lack of water and over 11,000 farmers are in serious trouble. Farmers are now buying water from private tankers. In frustration many are cutting down their own trees. The Union ministry of agriculture is expected to send a team to Maharashtra soon. Meanwhile the state government has decided to reserve water in the dams only for drinking purposes. About Rs 350 crore has been set aside for egs works. The opposition is demanding an immediate declaration of a drought year. Normally such a declaration is made in November or December after assessing the year's yields. "When you know the seeds have not been sown and major kharif crops like cotton have been lost, why wait till year end to declare it a drought?" questions an opposition leader.